Like many people, Tara Brown has mixed feelings about snakes. She says she quite likes the reptiles as long as there’s thick glass between her and them. Out in the wild though it’s a different story. So when told she’d be going on an epic adventure to a tiny speck of land off the coast of Brazil, inhabited by thousands of the most venomous vipers in the world, in her own words she was “freaked out”. Not surprisingly this place is known as Snake Island, and it’s probably the most dangerous location on the planet. In fact it’s so unsafe that it’s usually off limits to humans. But as deadly as the Golden Lancehead vipers of Snake Island are, they’re actually saving lives because their venom is being used to produce new groundbreaking medications. With science leading the way, Tara agreed to follow, even though she was always ready to run. Australians are competitive and love to win. No secret there. But there is one contest where winning might really mean losing: the population race. Currently our country is growing at more than twice the rate of America, the United Kingdom, and even China. Many politicians and economists say big is not only beautiful but essential, and that a booming population fuelled by immigration will guarantee our future prosperity. However, as Liam Bartlett finds out, that is a difficult argument to cop for everyday Aussies crushed by endless development, congestion and overcrowding. There are almost eight billion people on this crowded planet; some of us like to be individuals while others prefer to simply blend in. Charles Wooley meets Kewal Shiels, a young man who has no such choice. He stands out by standing head and shoulders above the world. 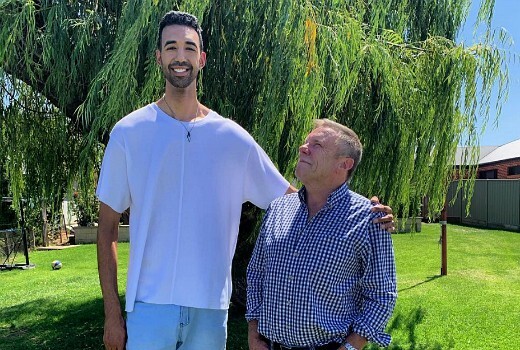 At 2.21 metres – seven foot three on the old scale – he is Australia’s tallest man. With no medical condition to account for his height, doctors say Kewal is simply the recipient of a lucky – or unlucky – hand in life. 8:30pm (ish) Sunday on Nine.